Mobile marketing can be a pretty broad term, referring to mobile ads, apps, mobile websites–just about any kind of marketing that happens on a mobile device. But mobile app marketing? That’s focused on app promotion, and even more importantly, the engagement and retention of users who have already downloaded your app. Your mobile audience has a whole different set of needs and desires than audiences in other channels–and add in that that they’re using different devices, too, and you have another set of parameters to consider. App user acquisition marketing is how app developers find their audience. With over 2 million apps in the Apple App Store and almost 3 million in Google Play, it can be tough for potential users to discover your app. That means the right kind of app marketing campaign can make a huge difference when it comes to helping your app build an audience. App Store Optimization helps make your app more visible in Apple’s App Store. By optimizing indexed copy like title and keywords and carefully choosing your app’s category, you can help the right users find your app in a crowded market. Wondering how your app listing stacks up? Grade it with our App Grader! The great thing about advertising on popular social media apps like Facebook, Twitter, and Facebook? Not only can you reach more potential users, you can target your ads to the right kind of audience for your mobile app. If you have limited ad spend, highly targeted social media ads are more likely to offer the kind of value you need, like more downloads. Get Some App Ad Inspiration. Give a status update or alert (think shipping confirmations or flight updates). Notify users about special offers, major new features, or a highly relevant app update. Use location to give users highly personalized messages. What’s the benefit of using push notifications? They can increase user engagement with your app–up to 88%. 65% of users with push notification enabled return to your app within 60 days. Only 19% of users who don’t do. 50% of users opt in to push notifications, and say they find them useful. Want to know more? See how users really feel about push notifications, and how mobile marketers can make them better. Rich push notifications are just like push notifications, but include an image, video, or sound files. This kind of rich content helps your message stand out in the din even more, and the stats prove it: users who received a rich push notification were 30% more engaged in an app. Give a personalized recommendation or suggestion. Request a review or rating in an app store. What’s the benefit of using in-app messages? 4X increase in conversion. This applies to in-app messages that appear in response to a user action. 27% increase in app launches. This means your users are more likely to open your app again if you’re communicating through in-app. Improved mobile UX. For actions like social sharing or entering information, an in-app message lets users accomplish something, and get right back to what they were doing. The best kind of marketing is built on thorough, accessible data. But what are the metrics that truly measure how your app is stacking up against the goals you set? Retention rate. The number of users who return to your app after the first visit. Daily/monthly active users. Your most important users are the ones who are actively using your app–not just letting it sit on their mobile devices. Time in app. What’s the amount of time users tend to spend in your app daily? Weekly? Monthly? Acquisitions. The number of users who download your app through a particular source–say, Instagram ads. Screen flow. The paths users take through your app. Lifetime value (LTV). What kind of value do your users represent throughout their time as users? Take a closer look at the metrics that make a difference for mobile marketers. 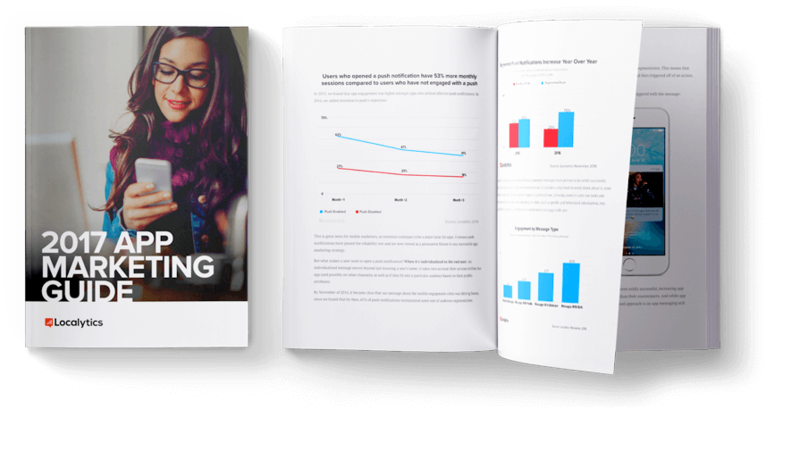 Get the only guide you’ll need.If you’re ready to build the kind of mobile app marketing strategy that transforms your relationship to your customers and users, we’re ready to show you how.